The less free countries include ones you’d expect like Iran, China, and Cuba based on government structure and policy. The most free country in the sample is Estonia followed by the UK. The partly free countries include a variety of developing countries ranging from Kenya to Russia which all have reputations of some sort of government or private sector control issues which would support the country not being categorized as completely free). Now, after reviewing the results of the report, I was curious if corruption plays a significant role in the determination of a country’s Internet Freedom assessment. In particular, India is a full democracy but didn’t receive a fully free score in the Freedom Report analysis but is known for corruption up and down the private and public sector. I then took a look at a recent global corruption study and looked at the scores for these same 15 countries on a corruption index and plotted them on a single graph to see if there was any obvious correlation. Transparency International is a global organization that fights against corruption. They published a free corruption index for 2008 which you can find here—again highly recommend reading this report. 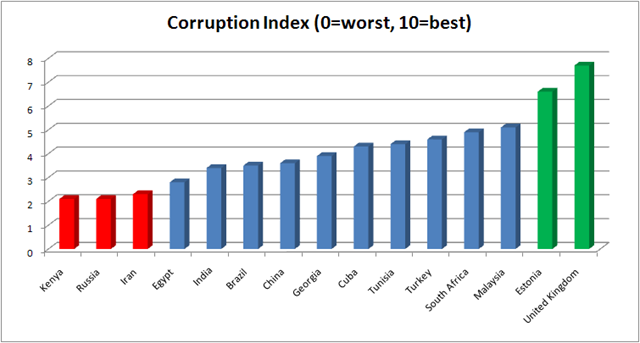 Below you’ll see a graph for the same 15 countries and the corruption score received for each (0= highly corrupt, 10= highly clean). A green colored bar means the country was in the top 25% percentile of the 180 countries the study evaluated, a red bar means a country was in the bottom 25% percentile of the 180 countries and a blue bar implies the country was in the middle 50% percentile. The same countries with the highest Internet Freedom scores had the cleanest corruption index scores: Estonia and United Kingdom. Likewise, some of the same countries with low Internet Freedom scores such as Iran and Russia were scored as highly corrupt. However, a country like Brazil which had a strong Internet Freedom score is around the 50% percentile when it comes to corruption (score of 3.5) (56th percentile out of 180 countries). Likewise, Kenya is a very interesting study—a nearly free Internet Freedom Ranking but one of the worst corruption index scores of 2.1 (19th percentile out of 180 countries). India is on the low end of the corruption scale with a score of 3.4 out of 10 which places it around the 50the percentile of the 180 countries evaluated. I have to believe that corruption in the government agencies, demonstrated by the corruption index score, has to be a factor in keeping India from a fully free Internet evaluation. Below is a graph combining the two studies into one graph for the 15 countries. The axis of the graph uses the exact scoring scale of the respective studies. Even though the studies are performed by different groups and thus wouldn’t be the most statistically accurate method of comparison, I do believe it is directionally appropriate and useful analysis. 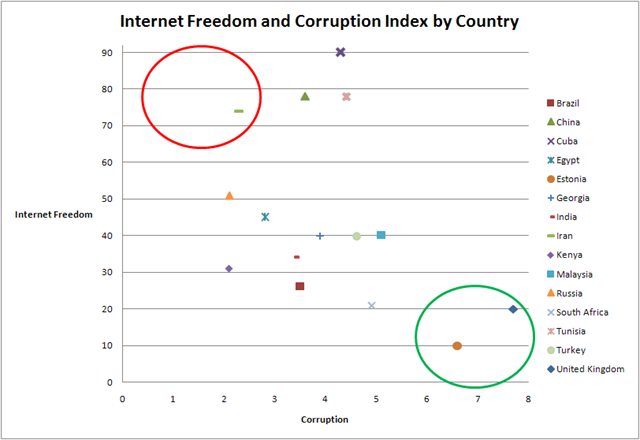 Countries in the bottom right quadrant have the best combination of Corruption and Internet Freedom Scores (Estonia and United Kingdom- green circle) and countries in the top left quadrant have the worst combination of scores (Iran- red circle). 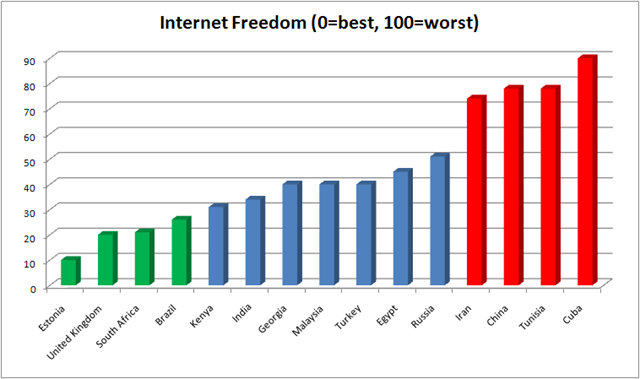 The graphs above don’t lead necessarily to consistent conclusions- as mentioned, Kenya has a strong Internet Freedom score but have a very poor corruption score, but on the flip side Iran and Russia have poor Internet Freedom and Corruption scores. LIkewise, top Internet free countries Estonia and the UK are very clean countries when it comes to corruption. Overall, I do think that corruption does impact the countries overall Internet Freedom score. While not specifically a category in the Internet Freedom methodology, corruption practices are inherently embedded in many of the criteria used, i.e. telecommunications infrastructure (do corrupt practices dictate which telecommunications companies prosper) or censorship (does corruption determine what gets censored and what doesn’t). One of the really interesting takeaways from this data is the success of Estonia in avoiding corruption and maintaining a very free Internet for their citizens since regaining its independence from the Soviet Union in 1991. Interestingly, the President of Estonia (Toomas Hendrik) will be speaking at the World Affairs Council in San Francisco on June 12. I now hope to attend this event. Interesting analysis, I wonder if the author has considered the possibility that countries with inefficient governments would have higher corruption rates but also poor internet censorship on account of their inefficiency itself. In other words, maybe the will is there but not the power?